Davenport – In a new Iowa poll conducted directly after the national conventions, John McCain has taken a lead over Barack Obama by a margin of 48% - 42% among likely Iowa voters. The survey also had some good news for Democrats. Governor Chet Culver's job approval rating currently sits at a strong 59%, while 29% of respondents indicated they do not approve of the job Chet Culver is doing as governor. Victory Enterprises surveys only registered voters who have participated in a recent general election. This eliminates the chance of surveys being conducted with people who are not registered to vote. The Victory Enterprises’ Statewide Iowa Poll was conducted September 8-9 of 402 Iowa voters with a 4.9% margin of error. Democrats, Republicans and No Party voters each represented 1/3 of the respondents, similar to the 2004 voter participation results. In addition, the survey was balanced so that each Congressional District has roughly 1/5th of the respondents. Females represented 53% of the respondents, while males represented 47%. The presidential ballot test was asked: And if the election for President were held today and you had to make a choice, would you vote for John McCain the Republican or Barack Obama the Democrat? Victory Enterprises is one of Iowa's most prolific political polling firms, having conducted over 300 political surveys in the last ten years. Minnesota has become a battleground in a presidential campaign that has dramatically tightened nationwide. A new Star Tribune Minnesota Poll shows that the race is now a dead heat between Barack Obama and John McCain, each supported by 45 percent of likely voters in the state. 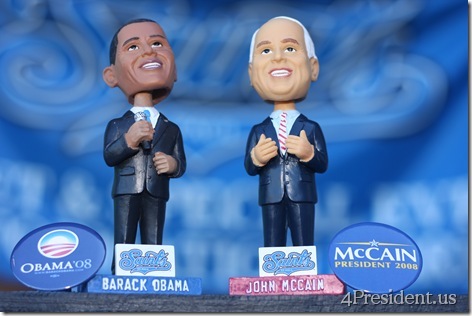 McCain And Obama Campaigns To Go Head To Head at St. Paul Saints Bobblelection Saturday. Help Barack Win the Bobblection! We've been called to help in an important election....before November 4th. Join us on Saturday, August 9th at the St. Paul Saints Game, and help Barack Obama win the Bobblection. 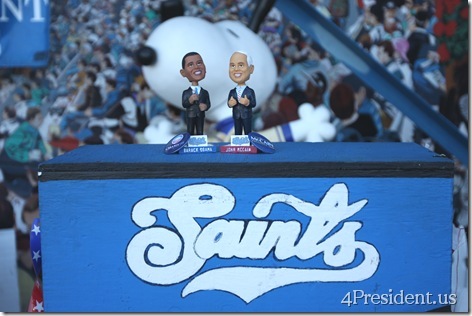 The first 2500 guests through the St. Paul Saints gates can choose a John McCain or Barack Obama bobblehead. The St. Paul Saints take on the Fort Worth Cats. Game time is at 7:05 p.m., but we're encouraging our supporters to arrive earlier to participate in the Bobblection. Please RSVP so we know how many people are going to be there! 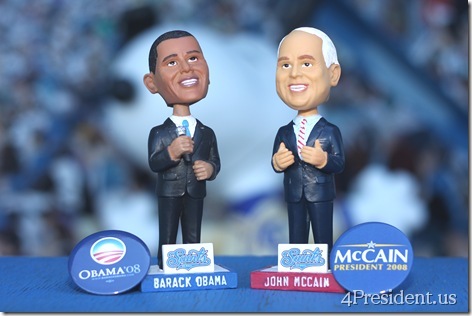 This Saturday at 5:30 the Minnesota McCain campaign will be meeting at the St. Paul Saints stadium to take part in the "Bobblection," in which fans will choose between Barack Obama and John McCain bobblehead dolls. We'll be out in full force to make sure that John McCain wins this vital contest - passing out signs and literature, signing up volunteers, and helping to decide the next President of the United States. Gametime is 7:05 PM - so we'll have a few hours of campaigning with the tailgaters and fellow fans before we can go in and get John McCain bobblehads of our own! ST. PAUL, MN (July 30, 2008) – CBS News Poll, Newsweek Poll, Gallup Poll and now the Goldklang Group Poll. With everyone trying to predict who will be the next President of the United States the St. Paul Saints will hold their own poll, Bobblection 2008 presented by Lommen Abdo Cole King & Stageberg, P.A., along with the five other teams owned by the Goldklang Group. 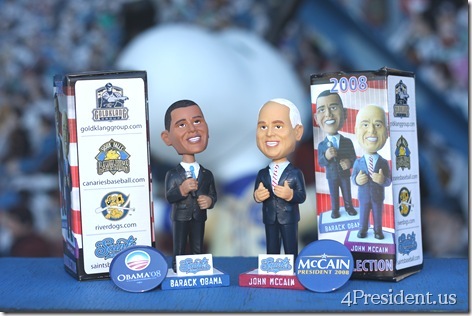 Whether you bobble to the left or right, red or blue, Saturday, August 9 is a day for casual and political junkies alike as fans entering Skinny Water Park will choose between a bobblehead of Republican nominee John McCain or Democratic nominee Barack Obama. There are 1,250 bobbleheads of each candidate and the first to run out will be declared the winner. As fans enter the gates they will head to a voting booth. They will then select either an Obama or McCain and for participating they will receive the bobblehead of the candidate they selected. Gametime is scheduled for 7:05 pm at Skinny Water Park as the Saints take on the Fort Worth Cats. For tickets to the August 9 game fans may contact the Saints box office at 651-644-6659 or visit saintsbaseball.com. From August 3-9, Midway Stadium will be known as Skinny Water Park as part of a unique one-week stadium naming rights agreement. CLEMSON – With only three days remaining before the South Carolina presidential primary on Saturday, Jan. 19, the Clemson University Palmetto Poll finds John McCain in the lead, with former Arkansas Gov. Mike Huckabee in second and two more contenders fighting it out for third place in the Palmetto State. The poll also reveals many voters might still change their minds. “Based on these figures, we expect that as many as one-quarter of the voters might decide in the last 24 hours before the Saturday election,” said Clemson political scientist and pollster David Woodard. McCain has emerged from the pack of GOP candidates in South Carolina since August, when former Tennessee senator Fred Thompson held the lead. McCain leads second place Huckabee by seven points. The final question in the poll asked voters about how certain they were that their choice of a candidate was conclusive. Fifty-three percent of likely GOP voters on Saturday say they are “very sure” they will stick with their choice. Forty-six percent said they may change their minds. “We find a very liquid environment in the state and the race is still subject to change,” Woodard said. The poll was conducted Jan. 9-15. Respondents were chosen for the sample if they voted in at least one of the past four Republican primaries. The margin of error for the figures is plus or minus 4.6 percent for the sample size of 450 prospective voters. All people in the survey said they will vote on Saturday. Republican Mitt Romney has pushed from a distant third place into a small lead in Iowa, the continuation of progress he has shown since the first of the year in the Hawkeye state, while Arizona Sen. John McCain has has remained steady and one-time front-runner Rudy Giuliani has slid substantially, a new Zogby International telephone poll shows. The telephone survey also shows that on the Democratic side of the aisle, the race in Iowa is remarkably stable – former North Carolina Sen. John Edwards continues to hold a small lead over Sens. Hillary Clinton of New York and Barack Obama of Illinois. The poll, conducted May 14 and 15, 2007, included 511 likely participants in the Democratic caucus next January, which carries a margin of error of +/– 4.4 percentage points. The survey of likely Republican caucus–goers includes 478 respondents and carries a margin of error of +/– 4.6 percentage points. Romney, who is also on top of the heap in the GOP race in New Hampshire, has nearly doubled since the last Zogby Iowa polling in March and has nearly quadrupled since January. Meanwhile, McCain has held steady over the same time period, while Giuliani has returned to where he was at the beginning of the year after a solid bump up in March. The percentage of undecided in the GOP race has remained constant at 22% throughout. Results of The Research 2000 Iowa Poll, December 18-20, 2006. Sample size: 600 likely voters. Margin of error: +- 4%. If the 2008 Democratic caucus were held today: John Edwards and Barack Obama tied at 22%, Tom Vilsack at 12%, and Hillary Clinton with 10%.